It was the main competitor to Gimbels (later Stern's) in the very busy Cross County Shopping Center, Yonkers NY. However it was way off the main strip. Bad location and eventually folded up shop. At least that store. 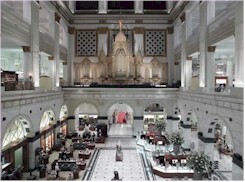 I remember shopping regularly in John Wanamaker's when I lived in Philadelphia about 25 years ago. It was a treat to eat in the restaurant there.